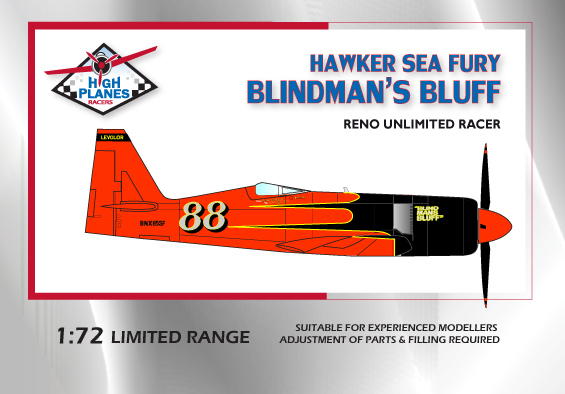 Blind Mans Bluff, Race no 88, started as an ex German civilian target tug Sea Fury TT 20. It was modified with a more powerful Pratt and Whitney R-3350 engine, designed to run on alcohol, rear mounted ? ?FW 190?? style canopy, clipped wings and tailplanes. It was a brave effort by the team, and they got it ready (just) for Reno ??87. Note the crew chiefs comments: http://aafo.com/hangartalk/showthread.php?t=5320 'Your question as to how many hours on the racer, roughly 3 hours plus the flight time from Scottsdale to Reno. The flight testing was on gasoline, and never flew on alcohol until Reno, but we had ran engines on a dyno in Hondo, Texas on it for many hours. They performed great there, but like they say in auto racing, it isn't always the same when the engine is put in the car. We were confident that it was O.K. to try it at Reno, but it didn't start right away, and all the cranking over was allowing the fuel injection to keep on squirting lots of alcohol into the cylinders, and most of it went to the lower cylinders and hydrauliced them and caused some piston and probably rod damage. Skip did fly several laps though. Hard to keep this short, so will try to address your other questions. Flights in Arizona were done by Bill Norton, and Joanne Osterud, and Joanne ferried it to Reno and back.?? The aircraft was bought by Tom Dwelle and became ? ?Critical Mass? ?.